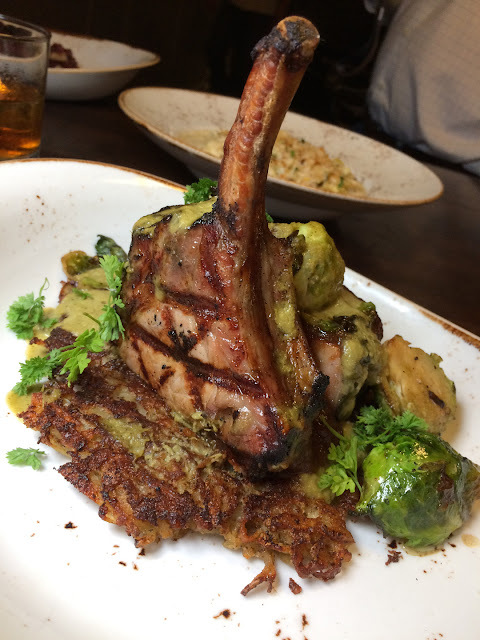 Along with all the other holidays that populate this time of year, one of the biggest causes for celebration in the Minx household is when B&O Brasserie puts out its new Fall menu. 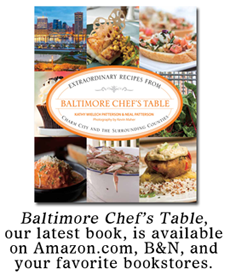 We always look forward to seeing what Chef Scott Hines and his sous chef Tyler Johnson have created with all the robust Fall ingredients and comforting flavors that we associate with Autumn. Since we were also finishing our Whole 30 diet, the chance to finally indulge our cravings for bread, sugar, and alcohol was pretty tempting. We started with the first cocktails we've had in a month. The Minx chose a full-bodied blended red wine while I picked something from their special Fall cocktail list. The "Monkey Business" matches Monkey Shoulder scotch with one of my great-grandfather's favorites Drambuie, along with Ramazzotti amaro, Fernet Branca, and black walnut bitters. A bruleed banana slice is cheekily perched on top to round out the monkey theme. 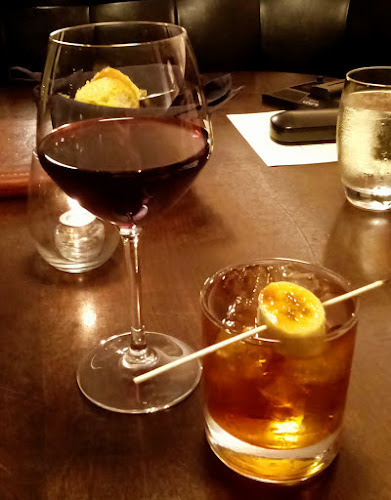 The scotch and scotch-based Drambuie add a smoky quality while the amaros and black walnut bitters bring a touch of bitterness to balance the almost maple-like sweetness. We were then treated to a collection of new appetizers starting with the housemade seasonal sausage, (which on this particular evening was a cheddar andouille) served with a red cabbage"sauerkraut" that was more sweet than sour, and an earthy mustard made with black mustard seeds and black garlic. All this dish needs is a bit of crusty bread and it could be a meal unto itself. 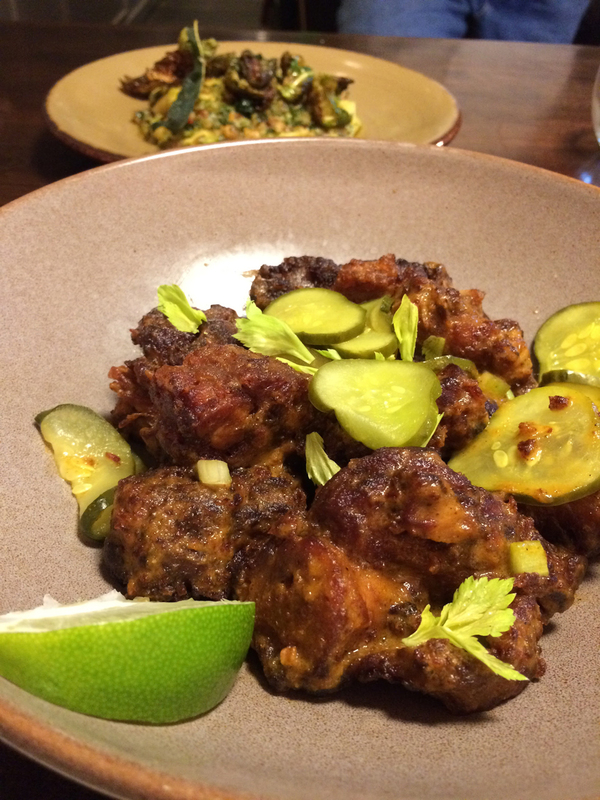 Restaurants aren't always successful in selling offal and other unusual animal parts to their customers, like the sweetbreads Chef Hines put on the menu earlier in the year. They were amazing, but diners aren't always receptive to trying new things. The Buffalo pigtails are doing well so far, and we could see why. They're the B&O's take on all of the various "Nashville" and "Buffalo"-style spicy meats that are popular right now, but with bits of succulent pig tail taking the place of the usual chicken. The tails are brined before frying, which makes them crispy on the outside and unctuous on the inside. They are coated with a spicy sauce that was just right for our palates. One has to be careful of the many small bones, but it's always fun the dig into this kind of dish. Housemade bread and butter pickles and celery hearts add touches of crunch and acidity. Given sous chef Tyler Johnson's Italian cooking background, there's bound to be some pasta on the menu and the pumpkin raviolo is a terrific Fall entry. The al dente pasta is stuffed with calabaza pumpkin, goat cheese, and a perfectly runny duck egg yolk. Each bite is rich and creamy with the comforting flavor of pumpkin. 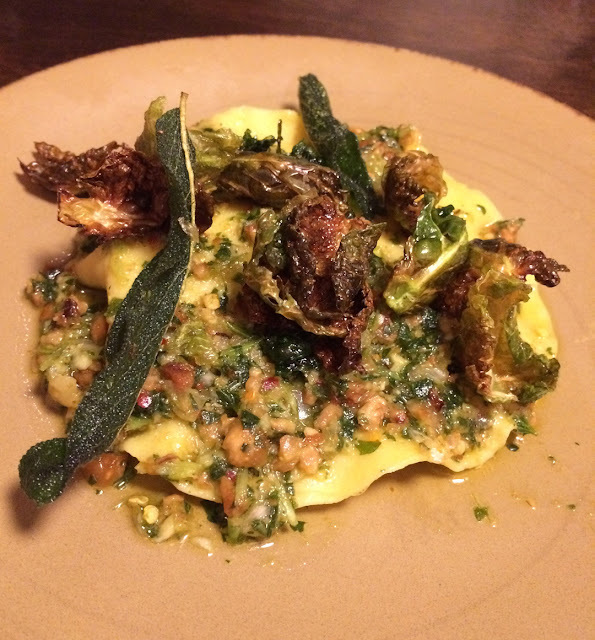 The raviolo is topped with a hazelnut picada (a Spanish pesto-like sauce) and crispy Brussels sprouts and herbs are sprinkled on top. I could go for three or four of these as an entree. Speaking of entrees, the Minx ordered the coffee-crusted pork chop. Chef Hines told us he was channeling his Jewish heritage with this dish--at least part of it--through the large potato latke at the bottom of the plate. Traditional accompaniments for latkes are applesauce and sour cream, and he chose to riff on those with a smoked apple butter glaze and a charred leek cream. Of course adding a fat pork chop to the dish, one with a fine grilled flavor, throws the whole homage out the window. No matter, it is a delicious sacrilege. 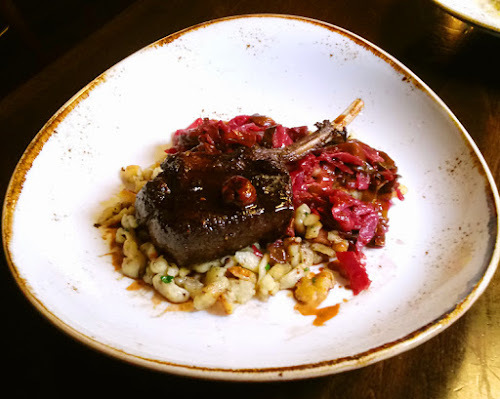 In Maryland where there is an over-abundance of deer, venison is about as Fall as you can get, so I ordered the rack of venison with juniper spaetzel, braised red cabbage, and bing cherry bordelaise. Venison can be a little tricky to cook because it's rather lean, but my venison was tender and juicy. 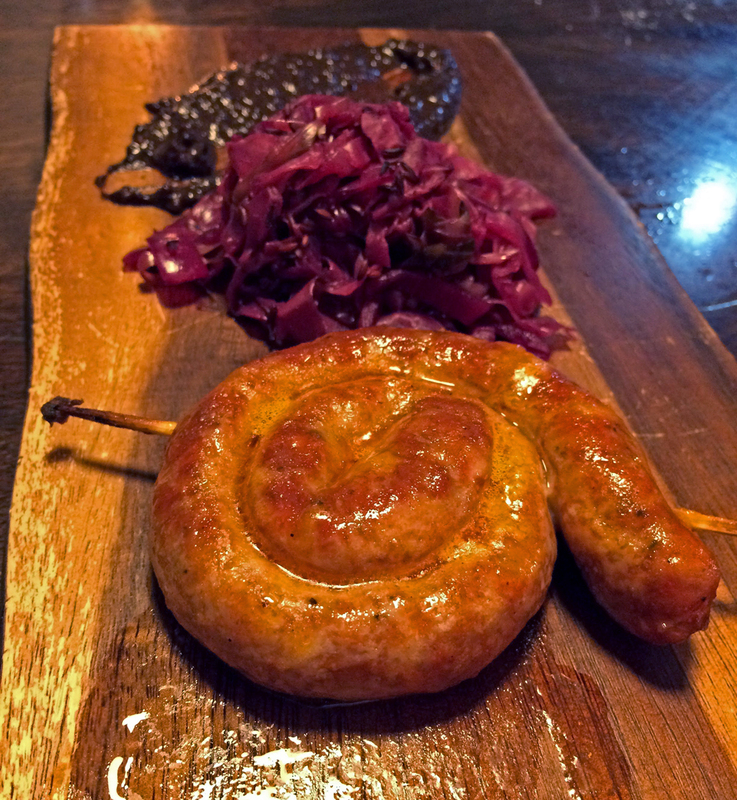 The spaetzel was redolent of juniper berries and a hint of orange while the red cabbage brought acidity and the bordelaise added the right amount of sweetness. I tried to restrain myself, but I picked up the bone and chewed off every last bit of meat. Although it wasn't officially a new Fall menu item, we were also treated to a plate of their carbonara. 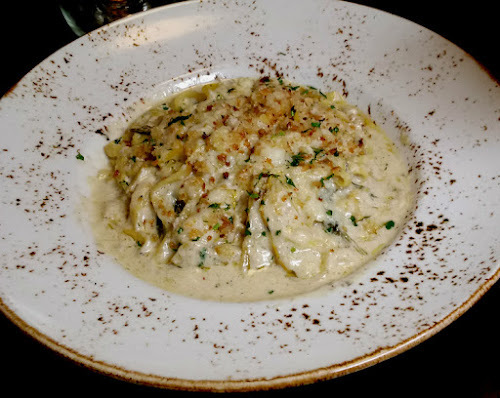 While it doesn't contain bacon like traditional carbonara, this dish does have garlic cream, delicata squash, Swiss chard, and grana padano cheese. The pasta itself is made in house with a chitarra, a device that creates ribbon-like strips of pasta somewhere between linguini and fettuccini. This was about as perfect a bowl of pasta as I've ever had, and I don't say such things lightly. 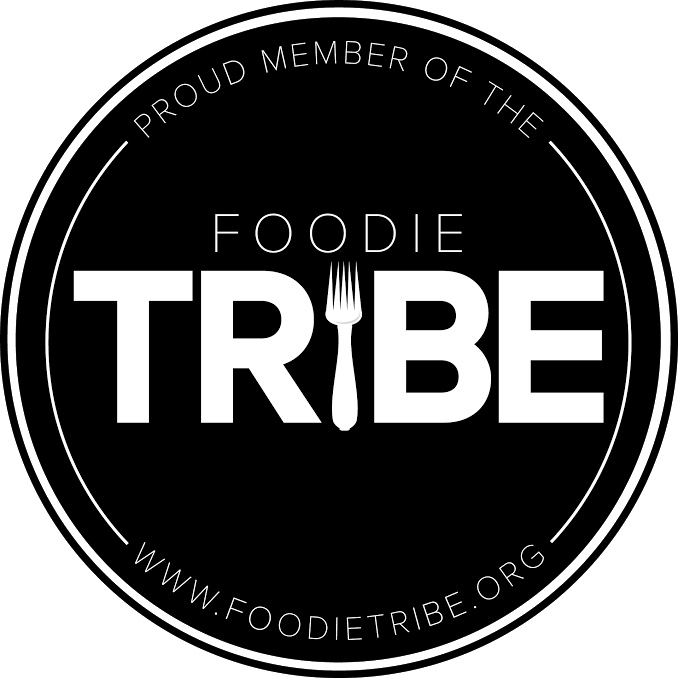 The Minx and I were concerned that, after not having any sugar or dairy for one month, the desserts might cause us some upset, but in the interest of food blogging, we soldiered on. I ordered the dark chocolate mocha cake and the Minx had the sticky date pudding. Choosing dark chocolate over milk was an inspired choice since it brings a deeper, less sweet flavor to this fluffy cake. The accompanying chocolate cremeux adds a richness, and the mascarpone ice cream offers another creamy texture. I particularly liked the bit of crunch provided by the generous scattering of cocoa nibs. I would've eaten it all if the Minx hadn't given me the evil eye. 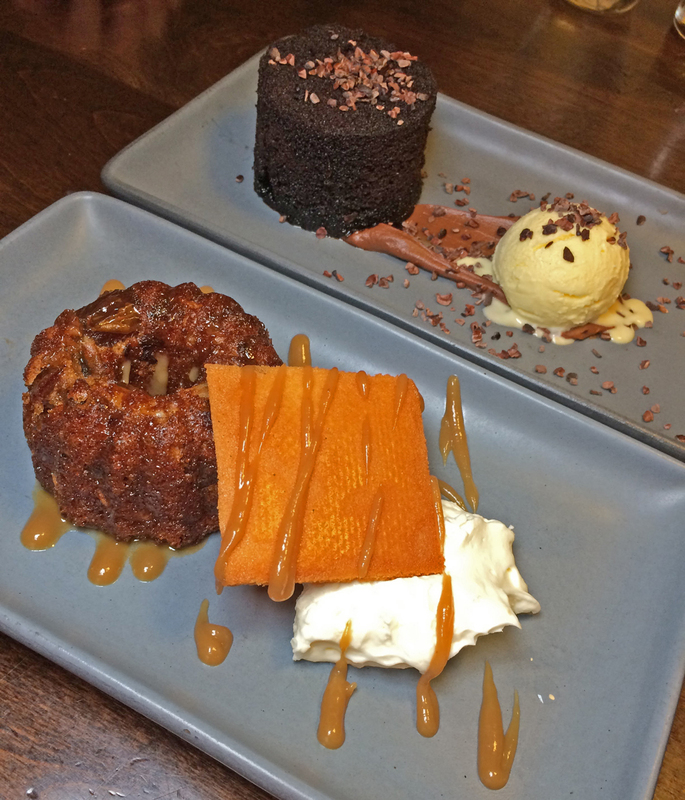 Her sticky date pudding looked like a mini bundt cake and was quite sticky as advertised. It also came with whipped cream and toffee sauce, but the real surprise was the tuile made with bacon fat. The bacon flavor really came through and added an almost savory quality to break up the sweetness of the dish. Fall brings a great many delights that we look forward to every year, not the least of which are the hearty meals associated with the Autumn harvest and the colder weather. Once again, B&O Brasserie has a Fall menu that will give you the warm, comforting feels that are so much a part of the season.